U Picnic is here again for the third year! The DinoFamily would love to join in the fun but it's happening on a Saturday thus clash with DinoBoy's weekend classes. Regardless of that, we like to do a shout out for this great event! U Picnic is organised by U Family with NTUC FairPrice and FairPrice Foundation as main sponsors, U Picnic will be continuing its tradition of being the only and largest mass picnic in Singapore. 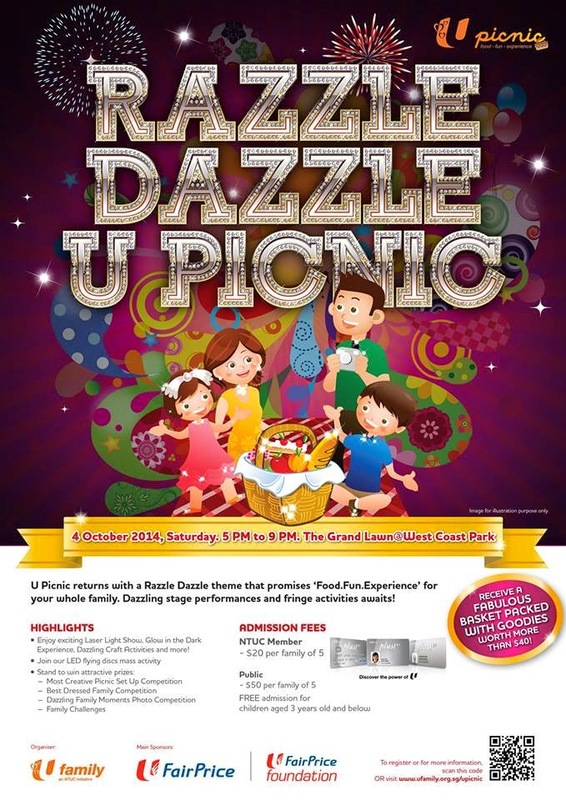 This year, the U Picnic returns with a ‘Razzle-Dazzle’ theme that promises Food.Fun.Experience for every one! * Free admission for children aged 3 years old and below. As with every major event we strongly suggest that you leave your car at home and take the public transport instead. There are free shuttle bus service provided for all U Picnic participants. So what are you waiting for? Ticketing has started on 15 July 2014, grab your tickets now over here before they are sold out! After that, plan on the great food and drinks to pack for U Picnic or purchase from the selected F&B on site. Hop by to U Family website here to find out more about the event. Even though we are unable to attend this event, NTUC U Family has graciously sponsored 3 sets of family package tickets as giveaway on our blog! Read more for the giveaway details. - Winners will be picked randomly by Rafflecopter widget. - The winner will be contacted by sponsor directly for collection of prize. The DinoFamily' will not be responsible anything after we give the winners' details to sponsor. What an awesome giveaway! Any excuse for a picnic.